Mercenary Geologist.com has been kind enough to allow me to be a syndicator of Mickey Fulp's musings on metals and mining topics. Your congenial host here was a Geology major in college, so these kinds of stories interest me. Here, Mr. Fulp explores platinum and its price relationships to gold and palladium. I recently have written an item or two about platinum, but the below piece is a much better perspective on platinum and palladium than I have been able to put together. Depending on how well you readers accept this article, I may devote more energy to platinum and its related metals. Platinum (Pt) and palladium (Pd) are the two most commonly used of the six platinum-group metals (aka platinoids), which also include rhodium, ruthenium, iridium, and osmium. As a group, these metals are rare in the Earth’s crust, silvery-white, malleable, and dense. They are highly resistant to wear, oxidation, and corrosion, have stable high-temperature and electrical characteristics, and exhibit catalytic properties. The two metals are produced from primary mines and as byproducts from nickel and copper refining. They occur in unusual and specific geological environments in relatively few places on Earth. The largest deposits currently exploited are theBushveld of South Africa, Norilsk in Russian Siberia, Great Dyke of Zimbabwe, Sudbury, Ontario, and Stillwater, Montana. According to USGS estimates, 2012 platinum mine production was 179 tonnes and palladium was 200 tonnes, down 8% and 7% from respective 2011 levels. Recycling constituted about 29% of total supply. However compared to 2012 gold production of about 2800 tonnes, these are small markets supplied by a few big mines and companies. South Africa dominated production at 74% with Russia at 13%. Remaining supplies came mostly from Zimbabwe, Canada, and the United States. Palladium mine production came from South Africa at 41% and Russia at 40%, followed by Canada, the United States, and Zimbabwe. As with many commodities, the United States is largely dependent on foreign supplies: 91% of our platinum and 54% of palladium consumption are imported. We consume nearly half of the world’s platinum and 30% of its palladium supplies. Because of their rarity and physical properties, platinum and palladium are considered precious metals and used in jewelry and investment coinage. However because demand is dominated by industrial applications, they are actually hybrid metals. Industrial use is overwhelmingly for chemical catalysts and dominated by exhaust systems for automobiles and trucks. In 2011, platinum use stood at 38% for auto-catalysts, 31% for jewelry, and nearly 6% for ETF investments. Other important demand came from the glass, chemical, electronics, petroleum, and medical industries. Palladium use was dominated by auto-catalysts at 71%. The electronics industry consumed 16% and dental, chemicals, jewelry, and minor uses constituted the remainder. There was a significant net outflow from ETF investments in 2011. Ratio reversals (<1.0) occurred at various time periods lasting from over two years to a one month spike in December 1992 when the historic low was set at 0.78. The most recent reversal was from November 2011 thru mid-January of this year. 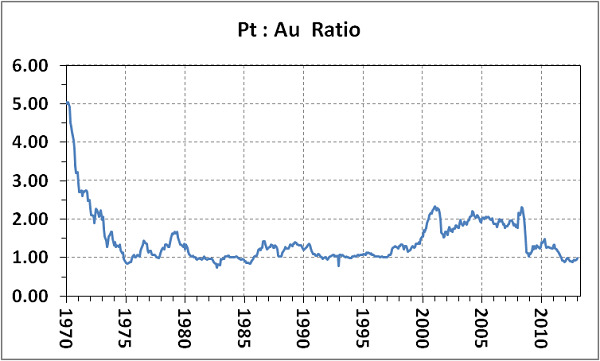 Palladium price was fixed at the nominal price of gold ($35-36/oz) until mid-1972. From January 2000 to mid-2001, historic lows less than one (<1.0) occurred when rumors spread that Russia would cease stockpile sales to the West. Hoarding by American auto companies caused the price to briefly soar over $1000/oz. But then Russia’s balance of payments suffered, palladium was dumped on the market, and the price went parabolic. 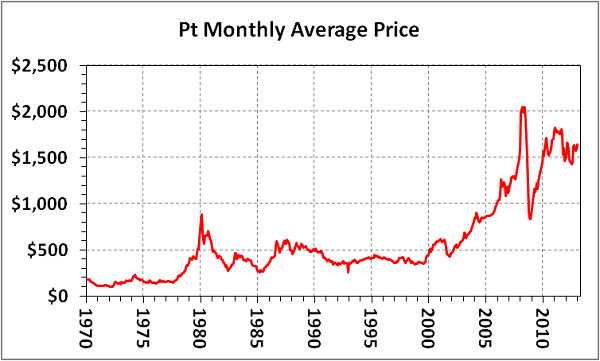 By July 2003, the metal reached a monthly average low of $162/oz. Ratio disruptions on the high side (>5.0) occurred in 1983-1984 and when auto industry demand collapsed during the global economic crisis in early 2009. My interest perks whenever an anomalous Pt : Au ratio (< 1.0) occurs over a significant time span. This indicates that platinum is oversold and presents a buying opportunity. Such was the case beginning in November 2011; only recently has the ratio gone back over 1.0. · In 2012, South African and Zimbabwean miners engaged in widespread, violent strikes resulting in severe supply disruptions and constrained market supplies. · An estimated 60% of South African mines currently operate at a loss or at break-even. · Economic conditions in the United States and China continue to improve and that has stimulated automotive sales and increased demand for platinoids. · Increasing environmental regulation of the auto industry in emerging market countries has resulted in higher demand, especially for palladium. · Although information from Russia operations is closely guarded and always opaque, it has been widely reported that historic palladium stockpiles are depleted and exports will cease this year. · Analyst consensus for significant 2013 supply deficits in both metals has led speculators to accumulate net long positions. 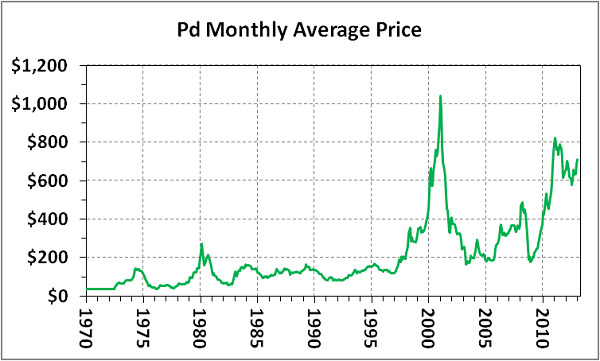 In my opinion, there is a new price paradigm developing for platinum and palladium. The supply-side case is particularly compelling with the economic viability of most primary platinum-palladium mines not economic given current price regimes. Unless prices rise substantially, South African supply disruption will evolve into long-term destruction. 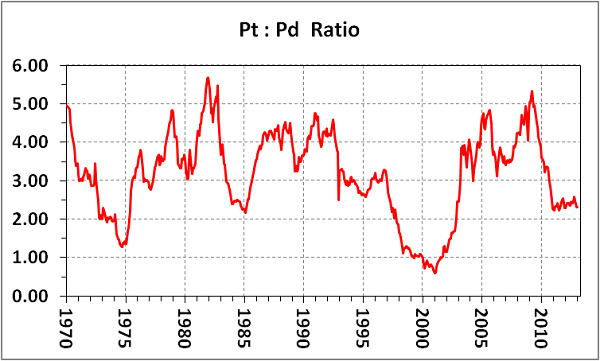 The bullish case is strengthened if Russian palladium exports are indeed ending. To my knowledge, there are no new major mines that can replace these looming reductions in platinoid supply. For a myriad of reasons, I maintain an ebullient view of platinum and palladium supply and demand fundamentals and predict that prices will remain robust for the short- to mid-term. P.S. If you want to learn more about my evolving views of the platinum and palladium markets, check out these interviews: August 10, 2010; August 25, 2010;October 14, 2011; November 14, 2011; September 12, 2012; and February 14, 2012. The Mercenary Geologist Michael S. “Mickey” Fulp is a Certified ProfessionalGeologist with a B.Sc. Earth Sciences with honor from the University of Tulsa, and M.Sc. Geology from the University of New Mexico. Mickey has 35 years experienceas an exploration geologist and analyst searching for economic deposits of base and precious metals, industrial minerals, uranium, coal, oil and gas, and water in North and South America, Europe, and Asia. Disclaimer: I am not a certified financial analyst, broker, or professional qualified to offer investment advice. Nothing in a report, commentary, this website, interview, and other content constitutes or can be construed as investment advice or an offer or solicitation to buy or sell stock. Information is obtained from research of public documents and content available on the company’s website, regulatory filings, various stock exchange websites, and stock information services, through discussions with company representatives, agents, other professionals and investors, and field visits. While the information is believed to be accurate and reliable, it is not guaranteed or implied to be so. The information may not be complete or correct; it is provided in good faith but without any legal responsibility or obligation to provide future updates. I accept no responsibility, or assume any liability, whatsoever, for any direct, indirect or consequential loss arising from the use of the information. The information contained in a report, commentary, this website, interview, and other content is subject to change without notice, may become outdated, and will not be updated. A report, commentary, this website, interview, and other content reflect my personal opinions and views and nothing more. All content of this website is subject to international copyright protection and no part or portion of this website, report, commentary, interview, and other content may be altered, reproduced, copied, emailed, faxed, or distributed in any form without the express written consent of Michael S. (Mickey) Fulp, Mercenary Geologist.com, LLC. Copyright © 2013 Mercenary Geologist.com, LLC. All Rights Reserved.